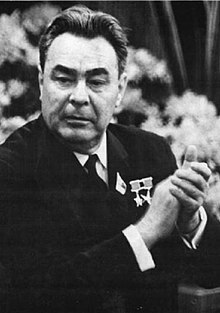 Leonid Ilyich Brezhnev (/ˈbrɛʒnɛf/; Russian: Леони́д Ильи́ч Бре́жнев, IPA: [lʲɪɐˈnʲid ɪˈlʲjidʑ ˈbrʲeʐnʲɪf] ( listen); Ukrainian: Леоні́д Іллі́ч Бре́жнєв, 19 December 1906 (O.S. 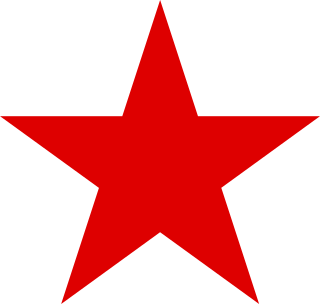 6 December) – 10 November 1982) was a Soviet politician. 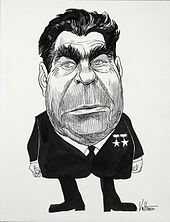 The fifth leader of the Soviet Union, he was General Secretary of the Central Committee of the governing Communist Party of the Soviet Union (CPSU) from 1964 until his death in 1982. Ideologically, he was a Marxist-Leninist. 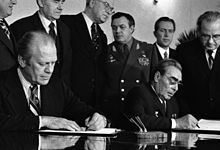 He presided over the Soviet's greatest involvement in world affairs, including détente with the West. 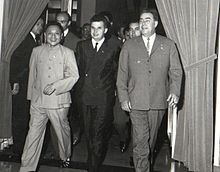 But he also increasingly confronted the Sino-Soviet split, which divided and weakened communist parties across the world. In domestic affairs, he presided over a steady decline in the economy, marked by corruption, inefficiency, and rapidly widening weakness in technological advances, especially computers. 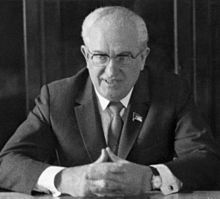 Nevertheless he was a force for political stability inside the Kremlin, maintaining his power despite his rapidly declining health after 1975.